Put your school website to work with effective school website management. A working mother of three who just moved into the area. A dad who travels during the week. A grandmother who drives in from the next town to babysit her four grandchildren after school each day. They all have something in common. They love their children and want them to have good lives, and they are each willing to sacrifice to make that dream a reality. Believe it or not, your school’s website can help parents recognize that your school wants to help them achieve that dream for their children as well. Assuming, that is, you know how to put it to work for you. Your school’s website serves as the hub for all of your school’s communication efforts. It is like having your own media network. You control the messaging, the topics covered, and the tone. If you don’t use this resource, someone else will step in and fill the void, and you won’t have any control over the messaging. This could be your local media, the gossip in the grocery isle, or a heated exchange during a board meeting. It’s your choice, and it is an essential one. Your school website is not only the first impression for those you are trying to attract, which includes new students and qualified staff, but it is also one of the resources to keep your current students and staff as satisfied customers. You need to spend as much, or more, effort on keeping your existing customers satisfied as you do on marketing to new ones. There are some obvious reasons for this. It costs more to attract new students and staff than it does to keep the ones you have. When existing students and staff become uninformed, misunderstandings can happen, and problems can arise. Understanding = supporting (and you need all the advocates you can get). Your first step will be to help your staff understand the tremendous value of an effective website. And we’re not just talking about a nice school website design (although that certainly doesn’t hurt). Your staff members are the ones who have all the great info that will inform your audiences. They are the ones with the stories, successes, and information that needs to be out there on the school website where it will do some good. But they are busy with their jobs, and unless you show them the benefits of contributing to the website, they won’t do it. Show your staff what’s in it for them! Save your staff time and frustration. Current information keeps everyone on the same page. Events, forms, activities, deadlines, priorities, requirements, rules, and purposes for all of your events help parents do their share. If that information is consistently where parents expect to find it when they need it, they are more likely to engage and support. Help them understand their audience’s needs. If your staff members are informed about what parents want and need from the school, they will naturally respond to those needs. This may mean you share parent survey results with them, whether it pertains to classroom information or not. It may mean you share parent feedback after an open house or board meeting (both positive and negative responses). Your staff will see solutions from their unique, in the trenches, perspective. This added perspective can solve many problems and add much value. Reward desired behaviors and the participants. What gets measured gets improved. So measure your successes. When a teacher, staff member, parent, or student provides a story or photos or shares a success that you use on the website, recognize and reward that behavior. Bring it up at a staff meeting. Send a note of thanks or congratulations. Tell the person’s peers about it. Reward those who engage with your information gathering efforts at board meetings, or give some other form of acknowledgment. It doesn’t have to be monetary to be valued and sought after; it can be a fun “award” like a cub reporter button to a student or a parent ambassador mug to your best parent resources. First of all, let everyone know what your school’s strategic communications goals are for the year. Did you set the goal of increasing enrollment? Are you trying to change perceptions about student behavior? Are you trying to engage parents? Whatever it is, let your staff know what they are and why the goals were selected (and how they will benefit when you achieve them). Invite them into the inner circle as a participant in achieving those goals with you. Select a style guide, and let everyone know what your grammar, spelling, and punctuation style guide is—and stick to it. For example, here at School Webmasters, we use the Chicago Manual of Style for our school sites (with a few exceptions that we spell out). Just pick one and stick with it. Be sure those with access to submitting information or updating the website know to NEVER use something they find on the Internet on your school site without permission from the owner (that includes graphics, content, etc.). Doing so is called plagiarism and trademark infringement. Be sure they know not to use student pictures without permission from parents (if that is a school policy). 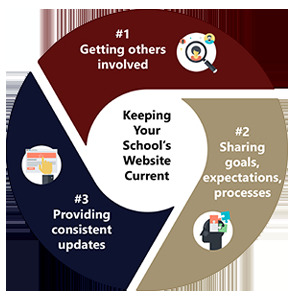 If you have LOTS of people updating the website (many districts utilize some fine CMS software so that updates are relatively simple), then have annual training and detailed processes and style guides in place for your school website processes. Do NOT assume that everyone will do the right thing and the site will maintain its professionalism without providing proper training and review of his/her work. We can show you thousands of sites that are a flat-out embarrassment (whether the school acknowledges that or not). If you manage your websites in-house, plan to train (and retrain) every year, and require even those who were previously trained to attend. Don't create a bottleneck where only one person is responsible for the whole website (unless that is their only job, they take it seriously, and they have the requisite skills sets). With the necessary training and a certain element of trust, allow for a process that gets the information to the website quickly and on time. If every post must be approved, information can quickly become out of date. Train, delegate stewardship, and acknowledge successes, so lots of great information gets on the school site. If the process for updating the website is cumbersome—or not within reach of those generating the information that needs to be there, the website will soon become out of date. When that happens, your targeted audience soon realizes there is no reason to return there again, as it provides no relevant information. At that point, your site will actually do more harm than good. Okay, so you'll need to be a bit of a nag. You can do it nicely by sending out reminders to anyone who has update access and encouraging them to add any information to the site that will make it more informative, highlight successes, and create a better public image for your school. Schedule regular site reviews. We do these at least every other month for our schools. Along with your monthly e-mail reminder, you might want to include a “best school websites” tip that might inspire them to get creative with the information they submit. You could share a success story that someone sent in that was perfect for social media and a news article, or send a link to another school website where they created some positive engagement through a website article or a Facebook and Twitter post or video. Remind your people about any upcoming activities on the calendar (themes, holidays, national events) that they can piggy-back off of to create a story. Share examples whenever possible. Ask them to find out which teachers have exciting lessons planned that might be good to cover in a story for the website and that could be shared along with photos and quotes from enthused students. If necessary, make an annual schedule of assignments to staff so they will know ahead of time and can prepare accordingly. Run regularly scheduled checks for broken links (at least every few months). Make sure anyone updating the website runs their copy through spell and grammar check software as well as carefully proofs and edits their work. Nothing looks worse than when parents find careless errors on their child’s school website. You are the educators, so high expectations are understandable. Check the site monthly for layout issues (is everything showing up the way you intended, is the information current, images displayed properly and loading quickly). Remind everyone with access to submit website or social media information (which should be nearly everyone) what the annual key messages and goals are so they are looking for ways to integrate your goals with their information. You’re more likely to hit your goals when everyone on your team is headed in the same direction. Create a communications calendar that will coordinate your social media posts with your website news articles. Look at regularly scheduled events (open house, back-to-school night, graduation, teacher appreciation day, etc. ), and get those scheduled into your communications calendar to use for topic idea generation. Turn key events into news stories that are accompanied by video or photos—don’t just stick a date on the calendar. It is easy to take your school website for granted. We educators can overlook how critical this simple tool is when influencing and winning over our audiences. When we use it well, we show parents why and how we do what we do and how we help their children reach their potential, become lifelong learners, dare to dream, and then achieve those dreams. It speaks to staff and prospective staff about what our collective values are and how we implement them. It is a look behind the curtain, creating transparency and trust. Let your district website, and especially each school website, show that busy working mom that you have her back by keeping the current information she needs just a click away. Tell that dad, who travels all week, the kinds of stories that show him the experiences and care his kids are receiving each day. The committed grandmother and all the other families whose children attend your school want to feel great about your school too. They want to believe in their child’s school. It’s your job to make sure your communication efforts inform them, day in and day out. Put your website to work making that happen. We'd also love to hear from you about what you are doing at your school that is working well. We'll share your successful ideas with others, so share!